Porto! Seems like just yesterday that we were in Chicago. The anticipation has been building for months. 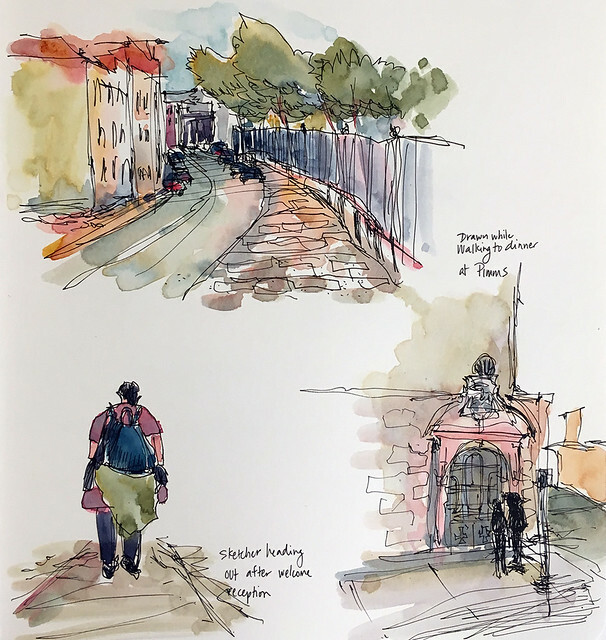 I flew in from London Gatwick, got to the Symposium hub at Alfandega do Porto and checked in, passing dozens of sketchers already capturing Porto on the way. I got my goodie bag and promptly went back to the hotel (InPatio Guest House - highly recommended!) to look through it. Sketchbooks, watercolors, pens, pencils, and more spilled out as usual thanks to the generous sponsors. I returned to the hub in time for the welcome reception, and then did my first sketches of the city on my way out. 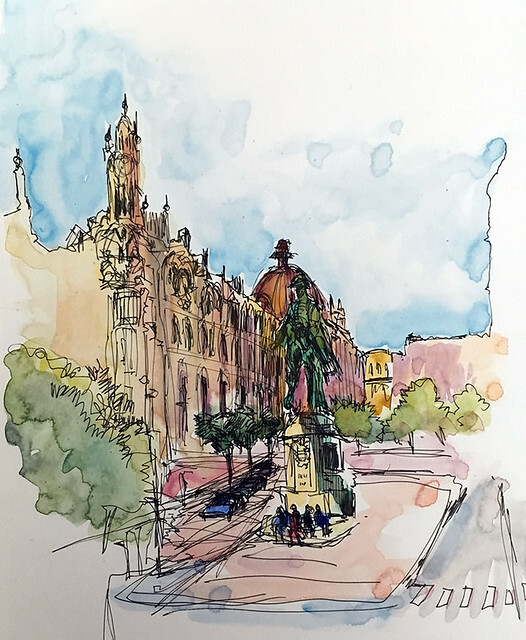 Porto is cobblestones and steep hills, a lively riverfront and modern boutiques, azulejo-covered churches and narrow alleys, port wine houses and water taxis. In short, a sketcher's paradise. My first workshop was with UK-based artist Lynda Gray. I loved her technique of delicate, layered washes on crisp lines. 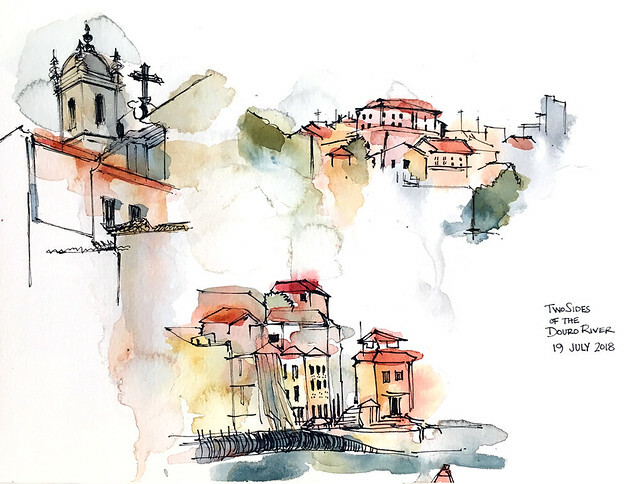 We drew three vignettes on hot press paper, letting the pale colors run and puddle over the drawings. I took the afternoon off to explore the city a bit and go shopping. Of course I stopped at the art supply stores; I loved the facade of this one. I had to visit Livraria Lello, often held to be one of the most beautiful bookstores in the world (and reportedly a source of inspiration for J.K. Rowling, author of the Harry Potter series). After I'd bought two(!) 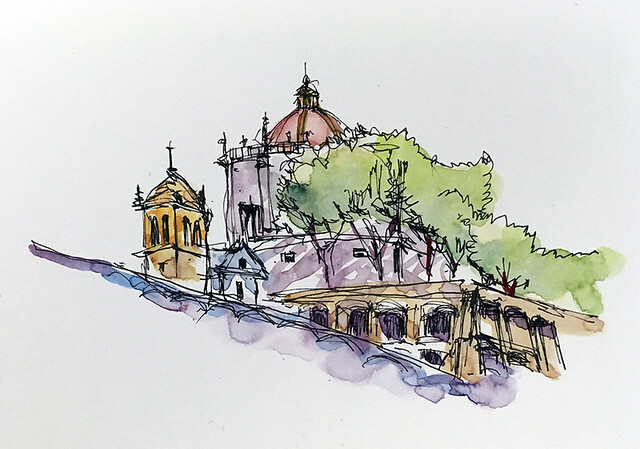 pairs of shoes and gotten myself a local cellphone SIM card, I stopped at the twin churches - Igreja do Carmo/Igreja dos Carmelitas -- for a quick sketch. 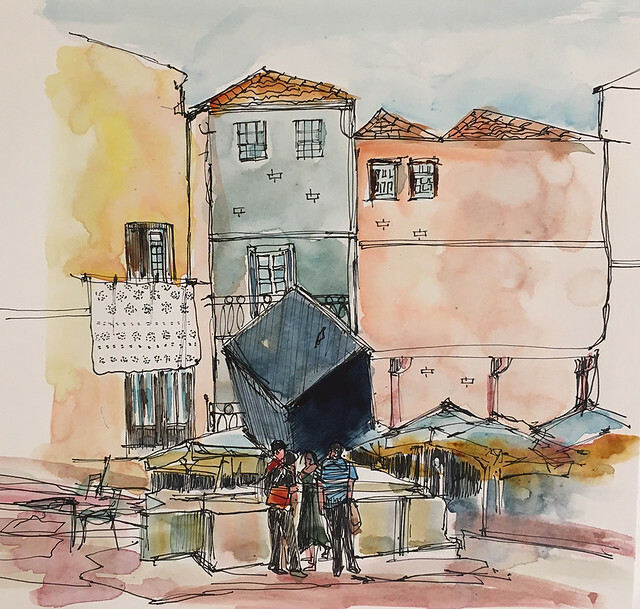 After dinner, I wandered down to the Praca da Ribeira, by the River Douro, which was the venue for the nightly "drink'n'draw." I sketched and chatted w/ other artists as the light slowly faded. This was a two-workshop day. 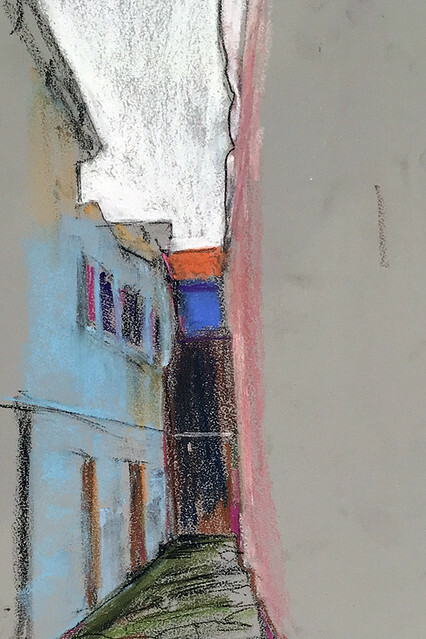 In the morning, I had a pastel session with Daniel Green. He had stepped in to substitute for William Cordero, who wasn't feeling well. Daniel did a fantastic job leading us through the exercises. 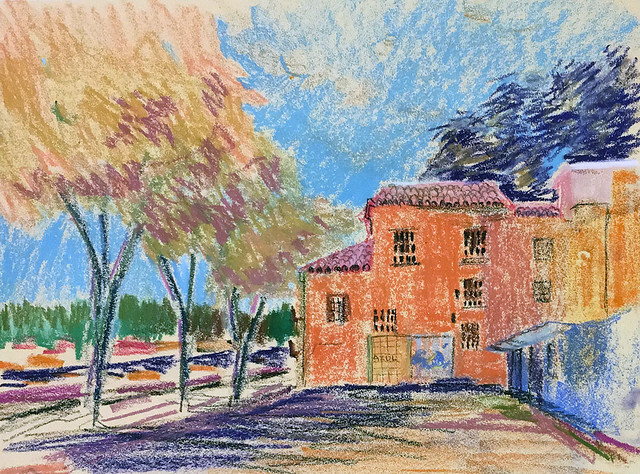 It was great fun to trot out my vintage pastel set and get my fingers dirty. After lunch, I took a workshop with Fred Lynch. Fred challenged us to think like an illustrator, considering what we were communicating in our sketch and what we were focusing on. Truth be told, my energy was flagging by this point in the day even though we were sitting in the shade. I could barely get my fingers to draw. Dinner that evening was at a restaurant on the river, Bacalhau. As we waited for our food, I took the opportunity to do a few more quick captures. 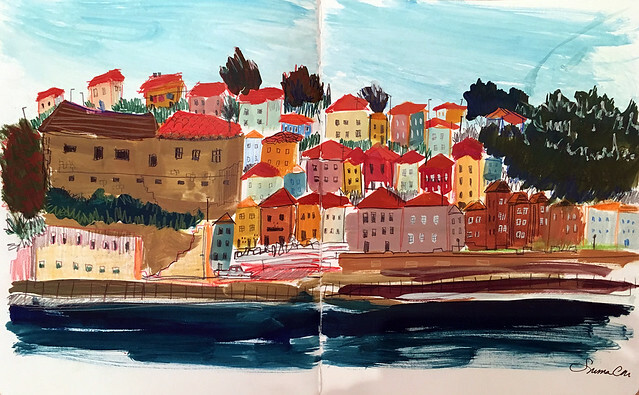 I was really looking forward to the morning workshop: Maru Godas' "Gouache Like a Child." I'd heard great things about it last year, and it did not disappoint. 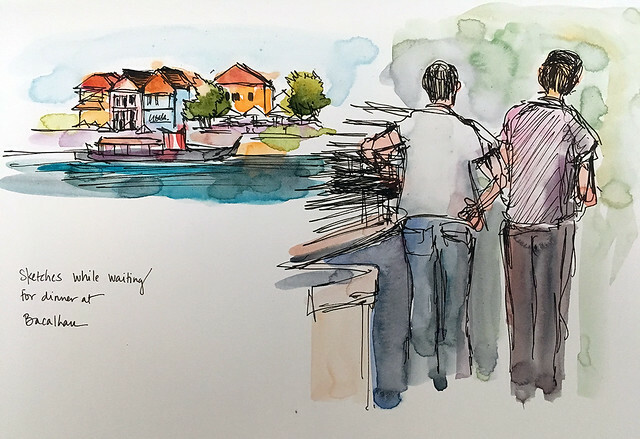 After some exercises on mixing our paint and getting the right consistency, we were encouraged to go big with a panoramic sketch of Gaia, across the river from the Alfandega. Using gouache with colored pencils was delightful! I'll definitely experiment with these media more in the future. 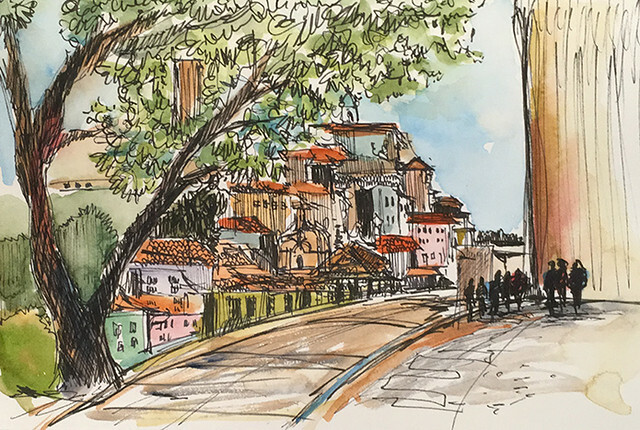 Had a lovely lunch with friends at a swank restaurant and somehow missed the final sketchwalk and photo (this is what happens when you wake up too late for the morning announcements). 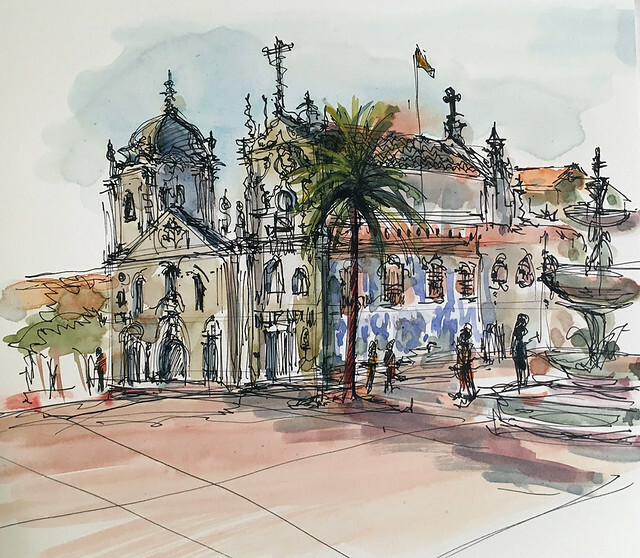 Since I'd walked up the hill to the Praca da Liberdade anyway, I decided to pause for a sketch. 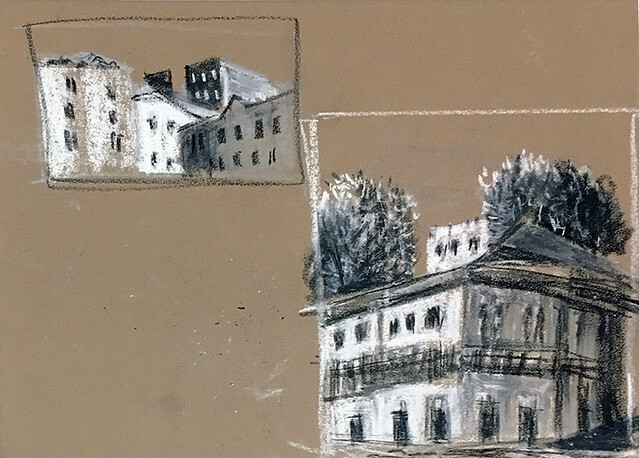 Then it was time for one more brief drawing, of the Old Convent of Nossa Senhora da Serra do Pilar as seen from our riverside restaurant, before heading to the closing reception. That's it from Porto; see you all next year in ... AMSTERDAM!! It was great to see you in Porto. Wish we had time to sketch together. Love seeing the work you did there. I am so happy that I stayed for a while after the symposium. Porto definitely deserved more time!